~ Baseball Coaching, Site Dedication ~ Two Very Special People! Baseball coaching, site dedications is created in tribute to these two very special individuals in my life, my father and my Little League coach. One of my father's missions in life was to be sure that I had an opportunity, if I wanted it, to experience sports, play an instrument and go to school. These were all things he hadn't had the chance to do, as one of 10 children growing up on a farm during and after the depression. All were things he put a high value on. On completion of the eighth grade, he was given the option to quit school and work on the farm, or move out. He moved to town and lived with an Aunt, working at a diner to pay his way and attend high school. With the advent of World War II, at age 30, he was drafted into the Army in April 1943. In January of 1944, he began 16 months as a POW, in a German prison camp in Poland. After the war, he went back to work, took advantage of the GI Bill, becoming a draftsman by going to school at night. We started early, playing catch and hitting balls he would throw to me, in the park across the street from our house. He had that universal love for the game which is inherent in America, and I fell in love with it also. 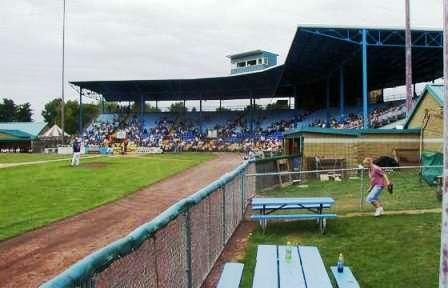 The Brooklyn Dodgers had a minor league franchise in the town where we were living. Dad had brought me home a baseball one night, a foul ball that had found his windshield in the parking lot. The ball was sitting on the seat when he went to go home. I was hooked! 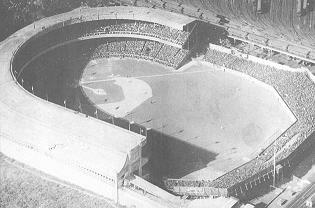 While there was a Dodger franchise in our town, my father was a New York Giants fan, in all aspects except one. That exception was his favorite baseball player, Lou Gehrig. His respect for Lou Gehrig came first from the person that Gehrig was, second from his talents on the field. Like many baseball fans, even today, you either like the Yankees or you don't. There seems to be little,or no, middle ground. So it was for my father. 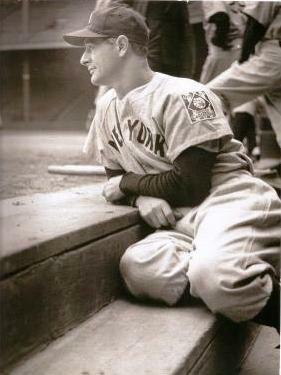 Lou Gehrig, the man, transcended all of that for him. As I completed my first year of Little League, his health was deteriorating. The doctor told him he needed to move to a drier climate, at which time we moved to Tucson, Arizona. For a kid in love with baseball, it was a great opportunity. Rare is the day in Tucson that you cannot get outside and do something related to baseball. I was out at every opportunity. If it wasn't at the park, it was playing ball in the front yard and breaking windows in the process. My friend across the street had a similar yard, enough grass to resemble an outfield, and the front of the house to serve as the outfield fence, never mind the trees we worked around. We developed a game to throw fly balls and line drives to each other. Dad taught me how to replace the window glass and our yards remained the outfields they had become. He was proud that I was able to go to college. I wrote somewhere around 25 letters to baseball programs around the country, all with the same result, come and enroll, if you make our team we can help you second semester. Dad had put together enough money to get me that first semester and I enrolled in a Junior College that provided me a job working on the baseball field. The rest, as they say, is history. I made that team and received some aide for the next three semesters. With an initial student loan, that process provided the same results, at a four year college. In February 1969, my father passed away, with complications from his WWII "experiences", as he referred to them. My greatest regret is he was not there to see us play in the NAIA World Series in 1970, which that year was held in Phoenix, Arizona. How he would have loved to be there! In spirit, I know he was. When I was home for Christmas in 1968, dad knew that I would graduate in May 1970. All the things he wanted for me had happened. Anything I have accomplished is a direct result of the opportunity and guidance he provided. He was special, I miss him every day. Dad, You Have Been With Me Every Day, At Every Game And Every Practice! 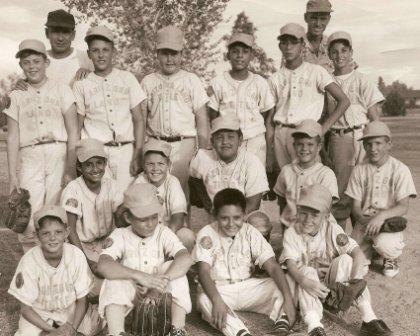 I am proud to say that Mr. Livingston, on left side in picture, was my Little League Coach. I do not know if he ever played baseball in his life; but it didn't matter to me or my teammates. He taught us how to play the game, how to win and how to lose. There is an art to both. He never argued with umpires, never yelled at or embarrassed kids. He was a respected friend to all the parents. It was a good time in the world of Little League Baseball. To this day I could not tell you if he knew how to throw a baseball, or if he could throw one. What mattered most to us was that he cared about each and every one of us. His practices were organized and fun. One of my fondest memories is the team piling into his old Ford, "woodie" station wagon and going to the A&W Root Beer for a frosty mug after our games. It was always welcome as we played all our games at 4:00 P.M. In Tucson, June and July, that equates to triple digit temperatures. This ritual happened after every game, win or lose. What struck me as special was that years after playing for Mr. Livingston, I ran into him in a restaurant in Tucson. At this point, I am more than halfway through my teaching and coaching career. He remembered me on sight, knew what I did for a living and told me where all the other members of that team were and what they were doing. The last time I saw him I was two years retired. His daughter had brought him to breakfast. He was living in an assisted living facility. As I was leaving I stopped by his table. He looked up and you could see the recognition in his eyes. He could still tell me about all the kids I played with. I consider myself fortunate to have had the opportunity to be coached by this gentleman. He took the love and interest in baseball, that my father had ignited, and fanned the flames ever stronger. The foundation they built for me would come to serve me well, in those good times and bad. Thank You Mr. Livingston! You Were Truly What Little League Baseball Is All About.